The other day Justin Robinson's track club, Gateway City United Athletics, posited that by virtue of his marks in the 60m, 200m and 400m over the course of the indoor season, there was little doubt the Hazelwood West (MO) High School junior was the "nation's most versatile sprinter." To be honest, it's a fair question. Robinson currently sits No. 5 in the 60m, No. 5 in the 200m and No. 1 in the 400m. He's also a member on the squad's talented 4x400 team. But is he the most versatile sprinter? You can't just say these things without figuring out for sure, so we wanted to dig down into the numbers. 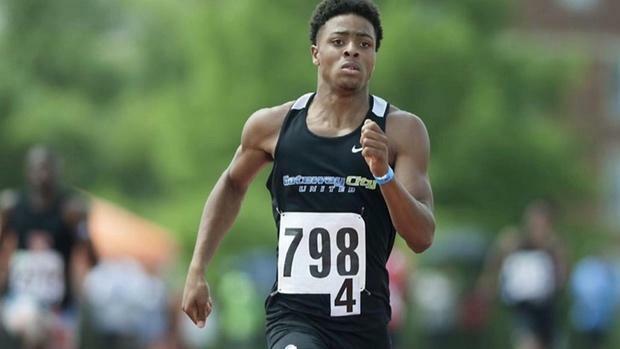 This indoor season, in 2019, we decided to figure out who's been the country's top overall sprint talent so far. To evaluate an athlete's overall impact in track and field, we have to evaluate how that athlete stands among his best events overall. And in this case, we decided to look at the nation's top athletes at 60m, 200m and 400m. To do that, we compiled a list of athletes who have all competed in those events this year -- but in the case of several who haven't run those events in 2019 but still have marks, or have secured times at distances where conversions are applicable (deemed by *), we've included those individuals on this list as well. After all that was said and done, we still came away with five very good athletes who weren't able to be part of this discussion: Anthony Brodie, Rashaun Stewart, Micah Williams, Marcellus Moore, and EJ Richardson. Brodie and Stewart didn't have 55m or 60m times, Richardson did not have a 200m and Williams and Moore didn't have recorded efforts at 400m. As you can see, Gateway City was not wrong. Justin Robinson has been the most versatile, and arguably the best, sprinter in the country in 2019. Three of the top four athletes have not generated times in every event in 2019. In the case of Lewis, we had to convert a 300m time to 400 meters. Ramey opened up with a 300m this weekend, so his 400m is converted and his 60m and 200m are from last year. Cooper also has only run a 300m, which means we used times from 2018 in his 60m and 200m valuation. So if take into consideration all of that, Robinson is one of just two sprinters in the top 5 -- the only exception being Kennedy Lightner -- to have even raced at every distance in 2019, thereby proving his ability on each of those levels. You can't argue stats. Behind Robinson, Nathaniel McRae's and Kennedy Harrison's early season times in Texas have held up, while perhaps the most underrated athlete on this list is Savion Hebron. We had to convert his 55m up to the 60m, but other than that, the Neshaminy senior has been extremely impressive throughout 2019.